Is it silly to think of being active on Twitter, Facebook, or YouTube without fully filling out your profiles on those networks? Then what about the people who are active on Buzz, but have not completed their Google Profile? Google Profiles let you enter a lot of information about yourself, from your current job position, location, schools, interests, etc. The beauty is you can also have links – lots of them – with keyword anchor text. And if you have had your account for awhile (I’m not sure when the “cutoff” date way) your links may all be dofollow. 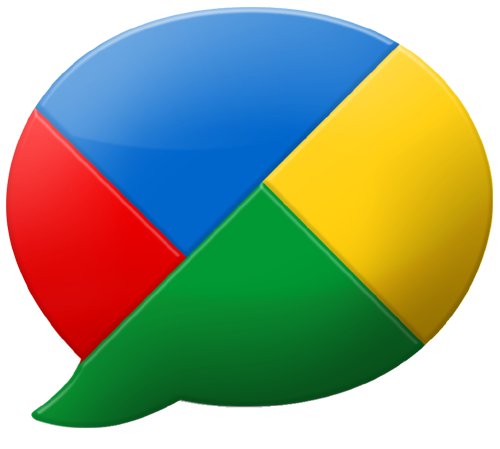 So why do you need to have a great Google Profile? 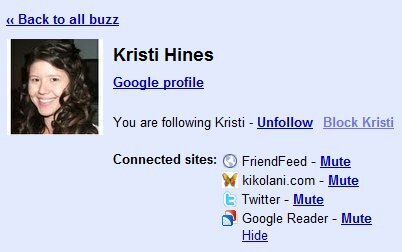 If you are trying to get a Google Buzz following by following others, think about which person will make a better impression in someone’s list of new followers. 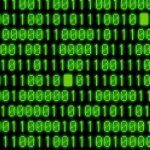 Of course, the person who will most likely be followed back will be the one whose profile shows common interests, as well as interesting activity. As you can see from the above shot of my own Google Profile, there are some key areas you will want to fill out in your profile that will be the “first impressions” people see when visiting. One of the biggest selling points of your profile will be your picture, especially if you upload an image that you use across all of your other online and social profiles. 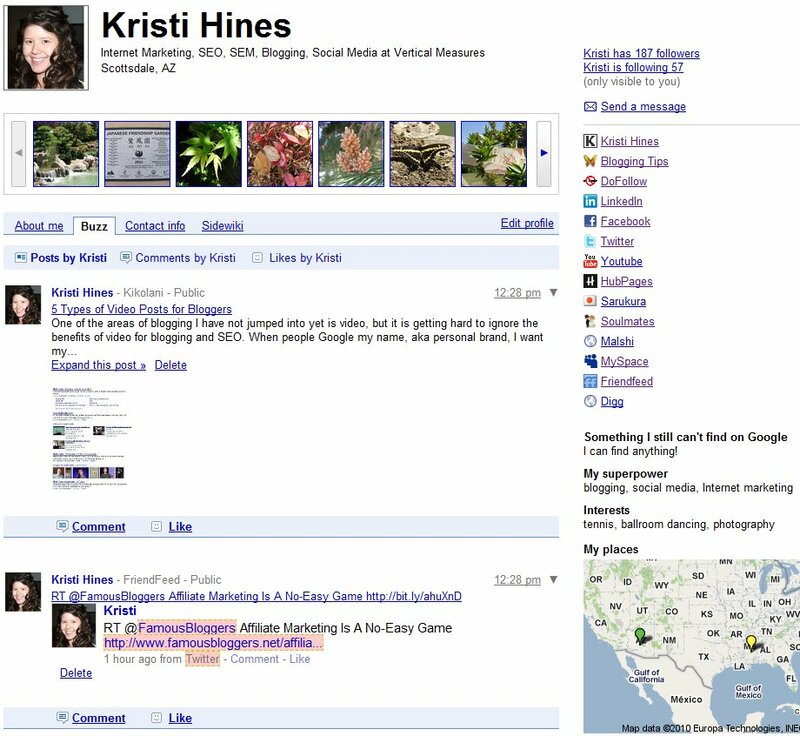 An added bonus is when people search you by your name, your Google profile may come up in the first page of search results. This may come in handy if you have a very common name that is hard to rank for. Right under your name will be your main description, which can be your job title, specialties, etc. These are supposed to add good SEO value to your profile. This comes up right after your headline “at Your Company”, and is also displayed with your name in search results (as seen in the John Smith example above). If you don’t have a company but a blog, putting your blog name here would be a good idea as well. Also added underneath your headline and in search results is your current location, which may help people identify you from others (for a common name) or as a local expert. 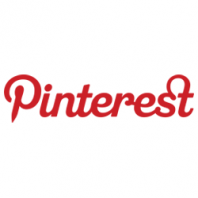 Do you have a Flickr or Picasa account? 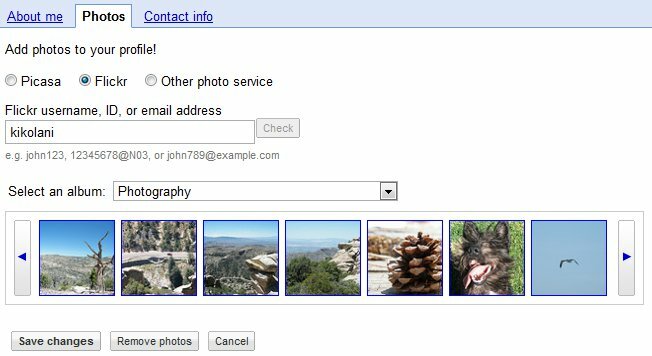 You can connect your photo sharing site account to your Google Profile, and (with Flickr at least) even choose which set to share. So, let’s say you only want to share pics of yourself and others at events like Blog World Expo. Just share that album to show what a networking superstar you are. The links in the right sidebar are composed from the links you add, which are available at the bottom of your edit profile page. 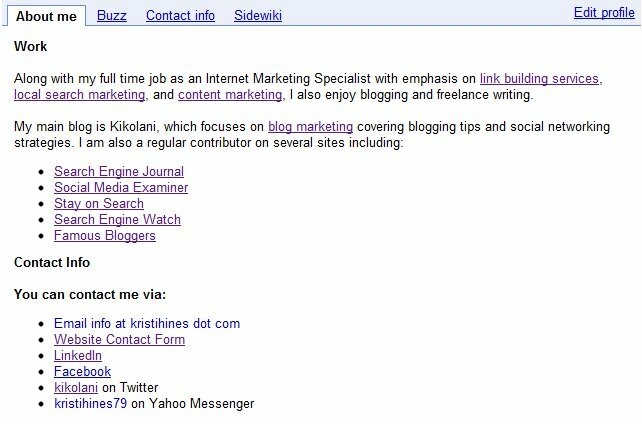 Google will try to find some of your public profiles based on your email address, but you can always add your own with keyword anchor text using the “Add custom links to my profile” section. You can add as many links as you like! This one seems like a silly question, but does show up, so make it count! Your superpowers should be the things you do best! Use this area to add some personality to your profile – help others get to know the real you behind your profession. The My Places map incorporates the location of where you live now and places where you grew up or lived. Although the About Me section is not the default view of your profile, it is a great place to write a longer, more thorough description about what you are all about. You can also use this spot to include even more keyword anchor text links, but don’t feel bad duplicating them, as some people may only see the ones in the right sidebar while viewing your Buzz activity stream. I chose to add a lot of my contact information in the About Me section, as you can only enter phone numbers, email addresses, physical addresses, and instant messenger information in that section. 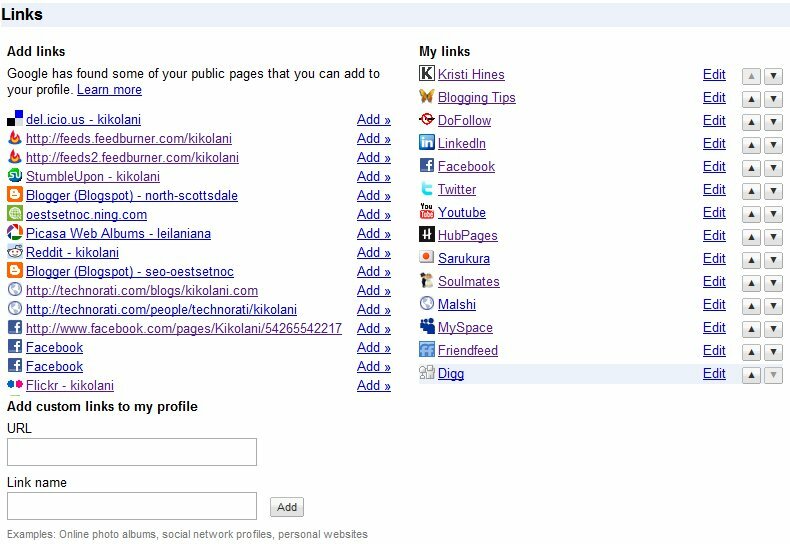 But you can, again, duplicate the info so people can find it in any spot on your profile that they look. While perusing other Google Profiles, I found one other interesting setting that helps clear up the clutter in your Buzz stream. If you click on someone’s name in Buzz, you will see their Buzz activity and a section on their connected sites. If you enjoy following someone on multiple networks, and you want to, say, stop seeing certain people’s Twitter or other social network feeds from sites they have connected to their Buzz, simply go to their profile and “Mute” the network from which you no longer want to see updates. Have you filled out your Google Profile yet? What other important information do you include in yours?